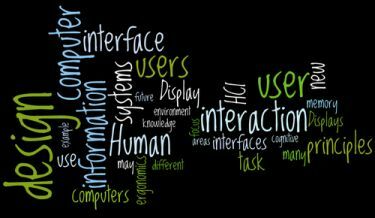 This course introduces students to the principles and practice of human-computer interaction. It first discusses foundational topics including historical context, the human factor, interaction elements, and the fundamentals of science and research. Next, students learn about the methods for conducting an experiment to evaluate a new computer interface or interaction technique. Finally, it presents detailed discussions and how-to analyses on models of interaction, focusing on descriptive models and predictive models.The course has a strong practical component. Students will conduct all stages of the development of a (simulated) smart phone or web app -- need finding, story boarding, rough and detailed implementation design, and evaluation by users. Grading: This is a mixed undergrad (UG) and graduate (G) student course. The homework assignments are designed to give you some practice for the midterm and final. The multi-stage course project is designed to give you a good exposure to the concepts of human computer interaction and design, and also to stimulate your creative abilities.